Your Labrador’s coat might look low maintenance, but those short and smooth hairs can be quite a handful. Not only do Labradors shed like there’s no tomorrow, they often have a real fondness for muck. Delighting in covering themselves in the stickiest, stinkiest substances that they can find. 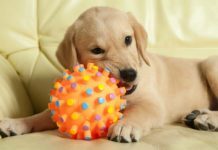 Fortunately, there are some great dog grooming supplies for Labradors available to help you in your efforts to keep him looking clean and tidy. 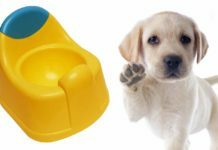 In this article we take a look at some great dog grooming supplies for Labradors. Giving you expert reviews of the best dog brushes, shampoo and more. The best brush for Labs tends to be one which can combat shedding effectively, and is designed for a shorter length of coat. 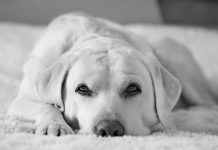 The best brush for Labrador owners will easily pull through their coat, removing the dead layer of fur without pulling out any of the existing hairs. Our favourite Labrador brush is the Furminator. When it comes to Labrador shedding solutions, the Furminator is a very safe choice. It removes those dead hairs which would otherwise end up lining your carpets and furniture, whilst gently brushing the remaining coat. Furminator have a couple of choices when it comes to brushes, including the de-shedding tool and the dog rake. The de-shedding tool is excellent for use during moulting season. When your Labrador’s coat seems to emerge in clumps whenever your back is turned, covering the house in a thin layer or fur. It comes in a range of sizes and is available for long and short coats. For the average Labrador choose to short hair variety in the large size. We also love the slicker brush for dogs. One of the most popular dog brushes available, the slicker brush consistently gets good reviews and is loved by Labs and their owners alike. It gently removes loose undercoat, tangles and matted hair from your dogs fur. The bristles consist of fine bent wires, which penetrate deep into your Lab’s coat but without scratching the skin beneath. The Slicker Brush is comfortable in your hand as well as along your dog’s body, and has the added benefit of being very easy to keep clean. Simply click the button to retract the bristles, and the hair will fall away and into your bin. The Furminator Rake is a great pin brush for dogs with thick fur. 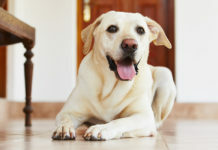 Because your Labrador has two layers of coat, it can be tricky to reach the undercoat with some rakes. The individual pins of the Furminator Rake glide easily through the dense coat and untangles any mats which may have formed. It is specially designed to reduce skin irritation and follow the contours of your dog’s body and head. It removes dirt, shedding hairs, mats and tangles. We are big fans of the Zoom Groom brushes. These soft rubber brushes are ideal for everyday brushing, but also a great help when it comes to spreading shampoo through your Lab’s coat. They massage your dog’s coat as they brush, and remove dead hairs and dirt particles from the fur. They also feel very comfortable in your hand, and come in a variety of fun bright colours. Brought to you by popular dog toy brand Kong, the Zoom Groom brush is entirely made of rubber and really does the job for your dogs short coat. The The Magic Coat Bath Brush is ideal for grooming your Labrador when wet. 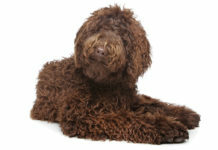 It glides easily through the fur, and is designed to be gentle but massaging for your dog’s skin. The magic coat love brush is designed to gently distribute shampoo and conditioner, and its also great for lifting dirt from the coat before bathing. If your Labrador is not a massive fan of brushes, then you might like to check out one of the popular pet grooming gloves. They look a bit like an oven glove, with a serious of rubber protrusions in the palm of your hand. Simply stroke your Labrador along her back in the way you normally would when fussing her, and the glove will lift the top layer of loose fur away from her. It is not ideal for reaching the undercoat, but will help to remove some of the dead hairs which are resting on top. Remember, you can also train your Labrador to be happy being groomed. For advice on how to do this, check out our 12 steps grooming article here. 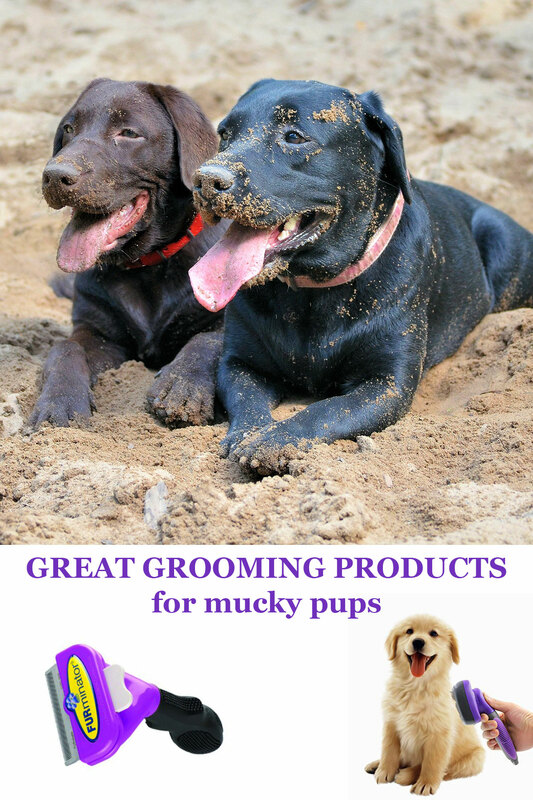 When it comes to Labrador approved dog grooming supplies, then a great shampoo is a must. 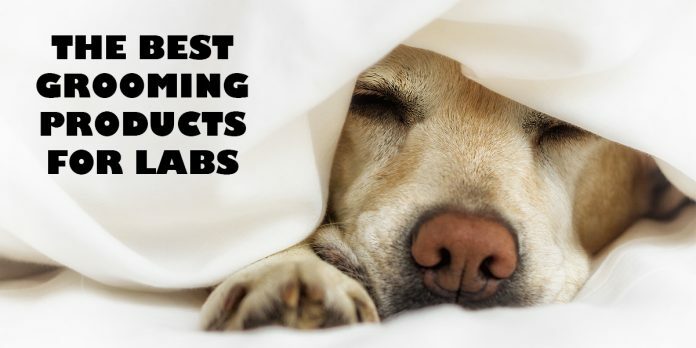 You have a lot of choices when it comes to the best dog shampoo for Labs. You will need to decide whether you want the one which smells the best, or one which helps to solve a problem. From natural and organic dog shampoos, to those which combat fleas or claim to help allergies, there are some great choices to pick from. If you are looking for a natural dog shampoo, then you might like to try Earthbath All Natural Pet Shampoo. It claims to be a totally natural pet care product, which is 100% bio-degradable and cruelty free. The Green Tea shampoo from the same range is aimed at relieving shedding. But importantly still an effective cleaning solution for your Labrador. If your Labrador has sensitive skin or suffers from allergies, then you will need to be careful when picking a new shampoo. Before full use do a patch test on an area of your dog’s skin, and wait for a couple of days to see whether any reaction occurs. There are some dog shampoos available which promote themselves as being designed for sensitive skin. One popular option is 4 Legger Organic Dog Shampoo. This shampoo claims to be gentle, effective, and veterinarian recommended for dogs of all ages. It is suitable for use on sensitive, to dry and itchy allergy skin. 4 Legger Organic Dog Shampoo is easy to lather and rinse as it contains no artificial thickeners that add toxicity to your dog’s bath. A little goes a long way with this shampoo. 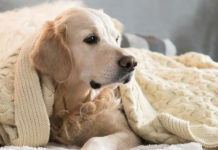 Remember however, if your Labrador has been diagnosed as suffering from allergies by your veterinarian, it’s always a good idea to have a chat with them before switching products. It is also possible to buy medicated dog shampoo for dealing with some of the more common coat and skin complaints which dogs suffer from. If your dog has fleas then it’s important to give him a veterinarian approved flea treatment. This will usually be in the form of a spot on gel which goes on the back of his neck. There are also flea shampoo options, which can help to kill fleas or reduce the itching whilst your dog is being treated. One option is Natural Chemistry De Flea Pet Shampoo. It is tested for safety, and instantly kills fleas, ticks, mites and lice on contact. The shampoo also leaves your dog’s coat looking clean and fresh. This shampoo is is non-toxic, non-alcoholic and contains no animal by products. The ingredients will not irritate your dog’s eyes or nose, and are easily applied to give a clean and clear finish. The company aims to create a small footprint on the environment and all their products are made from recycled materials. For those occasions when you don’t want to give your dog a complete hose down but still want to refresh his coat then we recommend Pet Head’s Dry Shampoo. It has a great clean smell, and freshens up your dog’s coat. Ideal for use before or during a grooming session. The dry shampoo doesn’t require rinsing afterwards, so it’s the ideal way to give your dog’s coat a boost between baths. Some dog shampoos can smell rather strong.Calily oatmeal shampoo has a light clean smell without being overpowering. Another gentle but more floral scented shampoo is Pet Pleasant Lavender and Evening Primrose shampoo. The best dog shampoo for Labs differs between the members of this wonderful breed. Think about what you want your dog shampoo to do for your pet’s coat. Labs have quite a strong natural body odor. Healthy Breeds Dog Deodorising shampoo claims to banish that wet doggy smell. Labradors also have a thick and naturally water resistant coat. Wahls shed control shampoo gets right into your dog’s coat and also claims to help control shedding. It smells great too. After a nice bath, or going for a swim, it’s useful to have some dog towels handy to wipe your Labrador down. Bob Martin’s Anti-bacterial Rub Downs are essentially baby wipes for dogs. Designed to help you clean off the dirt and mud picked up on your daily walks. They are fragranced with Aloe Vera to replace those less pleasant smells with something more palatable. These wipes are also great for removing dirt, loose hair and odour easily in the outdoors. Keeping your dog clean when you are on the go, with no need for access to water for a full wash.
What are your favourite dog grooming supplies for Labradors? Why not let us know in the comments section below! Lucy is a writer and blogger, who regularly provides posts for The Labrador Site. She has a BSc in Psychology and lives with her husband, daughter and numerous pets in Surrey. Best Dog Bed For Chewers – One He Can’t Get His Teeth Into! What does everyone like to use for cracked paw pads? Poor pup tripped and skidded a layer of skin off her front paw! HELP!! I have never heard of oatmeal shampoo before. I like how it is organic and has essential oils that will help with the coat care. I will definitely have to try this out! Thanks for the information! Can you recommend something for cleaning tearstains .one eye seems to have green discharge .tried bathing ,swiping away with cotton wool . Hi Alison, it sounds as though your dog’s eye may be infected. Pop him into your vet and let him have a look. Great info on grooming supplies. Since every time I bathe my chocolate lab I clean her ears as well, do you have any suggestions on ear care products? Plus any info on after swim ear care would be appreciated. Furminator, I was advised to buy one by a friend. I was absolutely amazed how much loose fur was in our Lab. Monty’s coat. On first use we had a pile of hair nearly as big as him ! When he sees the comb his tail wags like mad and he lays on his back waiting to be brushed. He obviously enjoys the sensation it gives. I would not hesitate to recommend this product. A big initial outlay but will probably save the money on vacuum cleaner bags !